^ Died on 14 September 1784: Michel~Nicolas~Bernard Lépicié, French painter, draftsman, and professor, born on 16 June 1735. He painted portraits, domestic genre scenes, and historical subjects. His best works, although not entirely free from the sentimentality of the period, have something of the tranquil beauty associated with Chardin. His father, Fran�ois-Bernard Lépicié [06 Oct 1698 – 17 Jan 1755] was an engraver and writer on art. His mother, Ren�e-Elisabeth Marlie L�pici� [1714�1773], was also an engraver. — Nicolas-Bernard Lépicié was taught engraving by his father before entering the studio of the painter Carle Vanloo. In 1759 he won second prize in the Prix de Rome competition at the Acad�mie Royale de Peinture et de Sculpture, but he never went to Rome. He was approved (agr��) by the Acad�mie Royale in 1764 on presentation of a vast painting of The Landing of William the Conqueror on the English Coast. He subsequently painted a series of pictures, including The Baptism of Christ (1765) and Christ and the Little Children (1767), as well as a Conversion of Saul (1767). In 1769 he was received (re�u) as a full member by the Acad�mie Royale on presentation of Achilles and the Centaur Chiron. He became an assistant professor in 1770 and a professor in 1777. His studio had a fine reputation, and several painters prominent in the Neo-classical generation were trained there, including Carle Vernet, Jean-Baptiste Regnault, Jean-Joseph Taillasson, Henri-Pierre Danloux, Jean-Fr�d�ric Schall, Nicolas-Antoine Taunay. Lépicié's early success was doubtless facilitated by his father�s reputation and by the friendship of Charles-Nicolas Cochin II, who had succeeded Bernard L�pici� as Secr�taire Perp�tuel of the Acad�mie Royale in 1755 and owned at least five of Nicolas-Bernard�s works. — Cour de ferme (1784, 64x77cm; 469x574pix excluding frame, 63kb including frame) _ Traversant une grave crise morale vers la fin de sa vie, l'artiste se retira fr�quemment � la campagne et peignit des sc�nes rustiques, alors compar�es � celles du flamand Teniers. Ce tableau s'accorde avec l'esprit d'un temps nouvellement �pris de la vie simple des champs, loin de la ville corrompue. — Achilles is Instructed in Music by the Centaur Chiron (1769; 142x195cm; gif 351x504pix, 64kb) _ Academy admission piece. 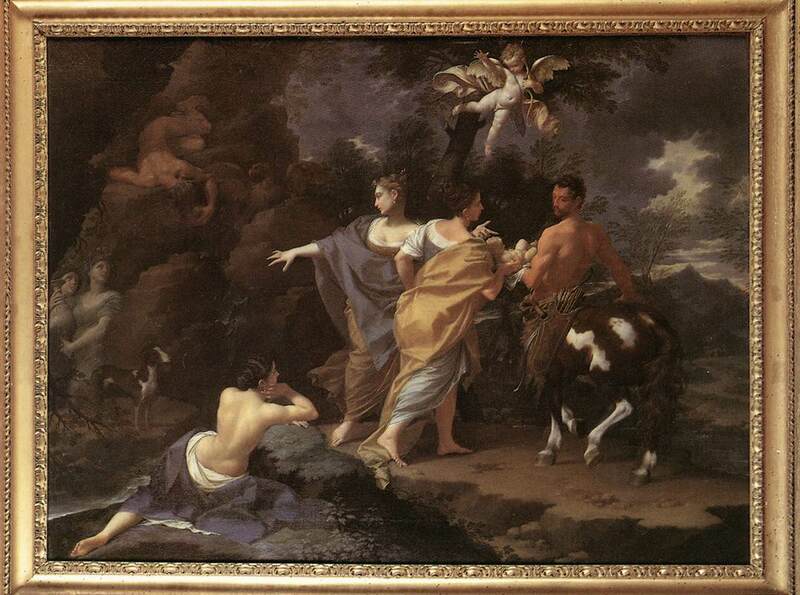 In Greek mythology, the centaur Chiron, who was skilled in the arts of music, war, hunting, ethics and medicine, had advised King Peleus, a mortal though a descendant of Zeus, how to make the sea nymph Thetis marry him. The child born from this union, Ligyron, had a problem with his heels which started when his mother gave him a bath, out in the sticks, without washing his heels, in fact without even getting them wet. Ligyron was not put in leg-irons, but he was handed over as an infant to be educated by Chiron, who renamed him Achilles. Achilles grew up to have severe psychological problems. He spent nine years as a transvestite, until he was recruited for an overseas military adventure which dragged on, unsuccessfully but bloodily, for another nine years until something snapped in Achilles's mind. At one time he refused to fight, and on another occasion he spent ten days dragging around behind his chariot the corpse of a dead enemy. For this desecration the gods withdrew their protection and he died in action. — He attended the Kunstgewerbeschule in Hamburg about 1894, and art academies in D�sseldorf and Berlin about 1897. In the first decades of the 20th century he exhibited with the New Secessionists. He drew and painted still-lifes and figures in landscapes and interiors in a strongly Expressionist style, which revealed his admiration for Cubism and for the work of Ferdinand Hodler. He was an assiduous worker; besides paintings, woodcuts and lithographs, he designed stained-glass windows, mosaics, murals, and painted ceilings. He also decorated the interiors of a number of Berlin theaters, as well as the Marmorhaus cinema (1913). Klein and Gerhard Marcks joined Gropius to organize the 1914 Deutscher Werkbund exhibition in Cologne. — Commedia dell'Arte Scenes (1926) five details (each approximately 310x436pix, 29kb) _ this is from a wooden inlay decorating the balcony rear wall of Berlin's Renaissance-Theater. It bears the reverse text: "Berliner Theater sind eine Reise wert – Intarsie aus dem Zuschauerraum des Renaissance-Theaters – Entwurf: Cesar Klein". _ C�sar Klein leitete die Klasse f�r Wand-, Glasmalerei und B�hnenbild an den Vereinigten Staatsschulen f�r freie und angewandte Kunst Berlin, als er den Auftrag f�r das Renaissance-Theater erhielt. Sein Intarsienwandbild zeigt Szenen und Motive der Commedia dell'arte mit den f�r sie typischen Figuren Harlekin, Pierrot, Columbine und anderen, die in ein System aus Stufenfolgen und Podien gestellt sind. Die Ausf�hrung erfolgte durch die Intarsienwerkstatt Nast, die zu den bekanntesten Berlins geh�rte. Die Bildfolge besteht aus g�ngigen Handlungsmotiven der Commedia dell'arte, in der es immer um die Liebe geht: Szenen der Werbung, Verf�hrung, des heimlichen Stelldicheins, der Intrige, Verwirrung, Eifersucht, Entf�hrung und des Duells. Kleins Darstellung des Maskenspiels, Reminiszenzen an Vorbilder wie Callot und Watteau, stellen Theatergeschichte dar. ^ >Died on 14 September 1637: Theodor Rombouts (or Rombout), Flemish artist born on 02 July 1597. He was a brother-in-law of Jan Philips van Thielen.  In his native Antwerp he was a student of Janssens, an Italianate painter of merit, then from about 1616 to about 1625 he was in Italy. In Rome, he came under the strong influence of the art of Caravaggio. Among others, two paintings by Rombouts, The Luteplayer and The Fortuneteller, are characterized by a Caravaggesque dramatic contrast of light and dark. 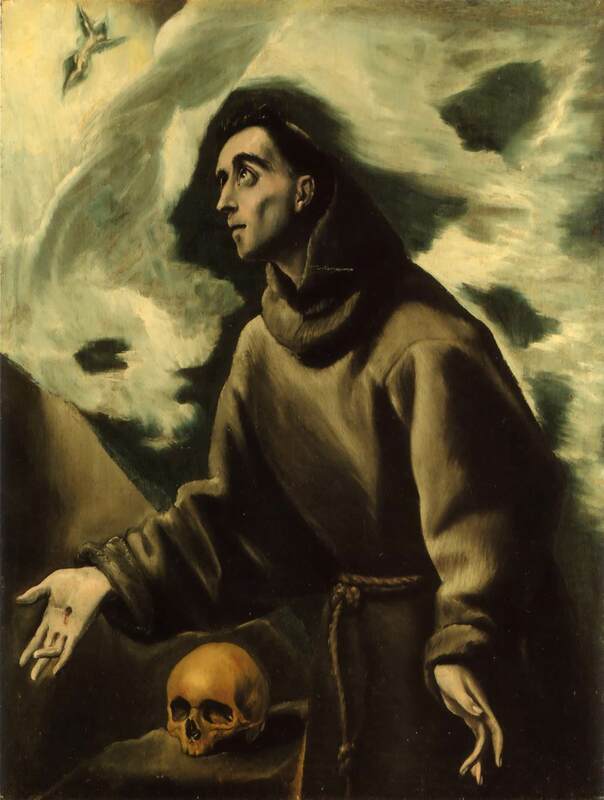 Upon his return to Antwerp, he continued to paint genre scenes of musicians and cardplayers, as well as religious subjects, using a strong tenebroso (heavily shadowed) style. In later years, Rombouts adopted a lighter, looser palette that suggests the influence of both Pieter Pauwel Rubens and Anthony van Dyck. 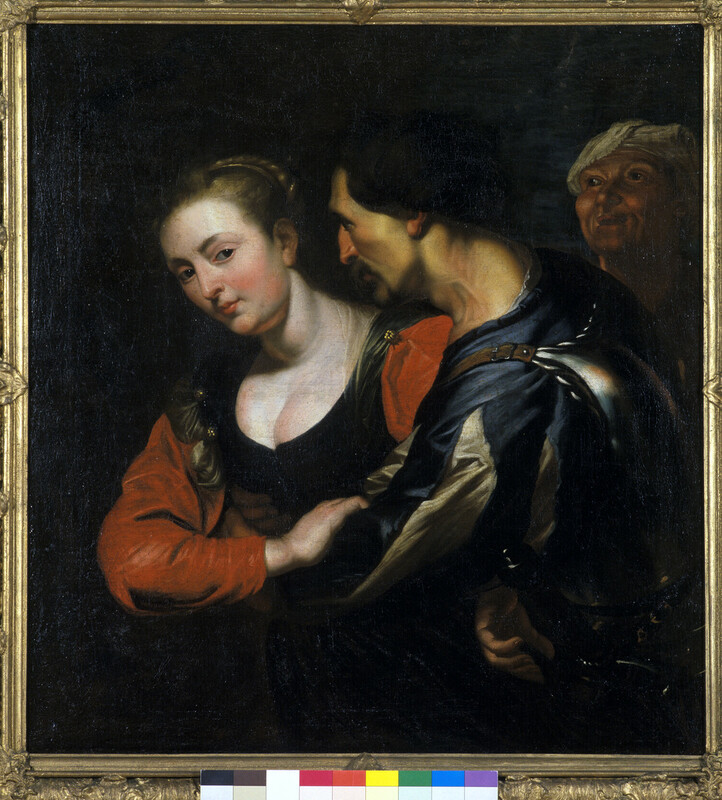 Cavalier and a Market Girl (360x465pix, 28kb), the painting of a market girl confronted with the amorous advances of a young cavalier, dates from this later period. The scene may be an allegory of the sense of touch; with the artichoke in the left foreground intended as a reminder that if not handled carefully, a beautiful and delicious thing can be a source of pleasure or pain. Perhaps the artist is telling us that relationships can be like the artichoke-attractive and yet potentially painful. –- The Backgammon Players(1634, 160 x 235cm; 460x700pix, 42kb — .ZOOM to 794x1400pix, 77kb) Two works by Theodoor Rombouts are among his most intriguing and unusual. As another painter drawn to Italy following his training in Antwerp, Rombouts quickly adopted many of Caravaggio's most superficial traits. Stylistic lessons learned by Rombouts in Italy are clearly evident in the work exhibited here. Caravaggesque lighting and figure placement are among the elements marking the new direction seen in his oeuvre at the time. When comparing The Backgammon Players the viewer is struck by how these and other features soon become tempered as Flemish influences reassert themselves in pictures by Rombouts. Two motifs  a drawn curtain and the raking light on the back wall-serve as signposts for this transition. In .The Musicians (648x386pix, 35kb — .ZOOM to 1111x772pix, 59kb), for example, where Caravaggio's influence is more evident, a heavy drape is pulled back to reveal an unarticulated wall. Only the strong contrasts of the raking light across this wall give any indication of the relative depth of the room. The Raleigh picture again finds Rombouts pressing his figures to the extreme foreground of the composition, but the room is deeper, the curtain all but eliminated, and the raking light reduced to a minimum. Here, the mildly classicizing Flemish style of Rubens and Van Dyck assumes a greater presence. The deeper space and monumental yet mildly classicizing figures found in The Backgammon Players effectively remove it from the more Caravaggesque manner seen in The Musicians. The painter's capitulation in The Backgammon Players to the manner of the great Flemish masters of the seventeenth century is almost complete. Although it falls within the mainstream of the Flemish Baroque style, the painting is not entirely divorced from the innovations of Caravaggio. There are many reminders of this Antwerp painter's sojourn in Italy and his waning attraction for the art of Caravaggio, including the placement of the figures, the rustic character given to some of them, and the hint of Caravaggesque tenebrism. Recent scholarship on The Backgammon Players has centered on two aspects of its composition: the identification of some of the figures and an interpretation of the game of backgammon, or tric-trac. 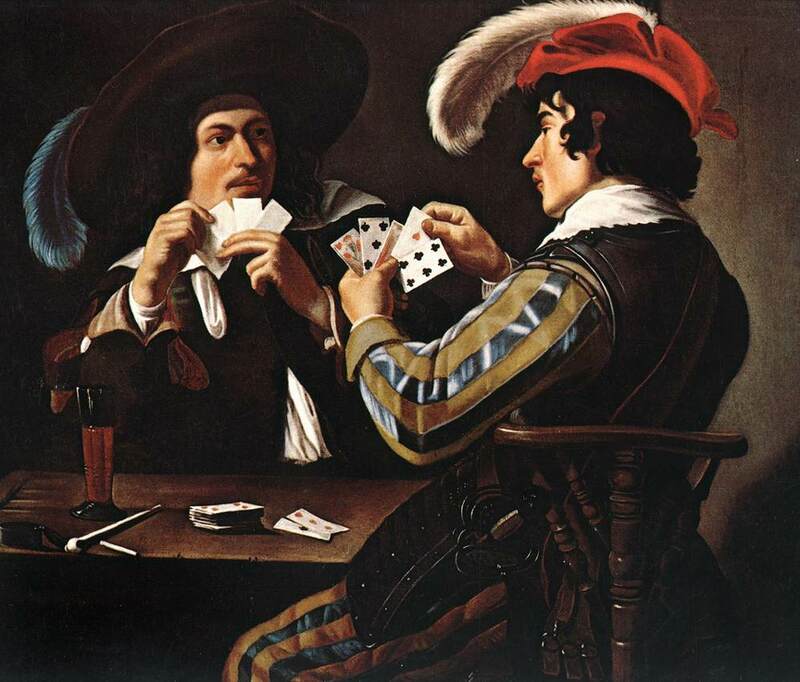 Genre scenes with moralizing overtones, both in paintings and prints, have long been associated with Rombouts, and interpretation of these scenes, including the Raleigh picture, has emphasized the negative qualities connected with games, be they cards or backgammon. Slatkes, for example, in explaining early misunderstandings of the imagery, linked the two games. There was some early confusion concerning both the subject matter and date of this late work by Rombouts when Roggen described it as depicting chess players and incorrectly read the date as 1632. The error regarding the subject was understandable, given the unusually elegant rendering of the various figures, in addition to their elaborate costumes, graceful gestures, and upper-class demeanor. Indeed, these are exactly what one would expect to find in a painting of the courtly game of chess rather than in one of backgammon, much less highly regarded. Except for the inclusion of the backgammon board, everything in the manner in which Rombouts has handled his subject matter, including the attitude of the three onlookers to the viewer's right, suggests that he may have originally had the old allegorical chess game of the sexes in mind. Backgammon, in contrast, was usually associated with, at best, idle time-wasting and at worst, gambling and violent behavior. Do the colorful costume and feathered hat of the work's principal "player" in the Raleigh picture, including the sword at his waist, link him to the more aristocratic figures of the woman and her young daughter? Or should the viewer instead come to more negative conclusions regarding the character of this man, and by association his followers? It remains to be seen whether messages related to other sins, to games of love, or to backgammon's condemnation by the church can be read into the scene. Among the obstacles interfering with such interpretations for The Backgammon Players are the portraits found within the composition. The three prominent figures in the painting have been linked to known portraits of the painter, his wife, and young daughter. Their presence calls into question any possible negative tone of the imagery. Vlieghe, in citing professional pride and marital harmony as reasons behind some of Rombouts's other images of himself and family, is not as certain about the function of this work. Consequently, the difficulty encountered by scholars in trying to reconcile the two opposing faces of The Backgammon Players leaves the full significance of this mature work by Rombouts lost within the shadows of the seventeenth century. — The Denial by Saint Peter (94x206cm; 516x1240pix, 86kb _ ZOOM to 1132x2480pix, 359kb) _ Rombouts was one of the most original of the Flemish Caravaggisti as exemplified by "The Denial of St Peter". He concentrated mainly on paintings of drinking scenes, musicians and gamblers and preferred a wide and horizontal format in which his dramatically gesturing figures and contrary movements provided cohesion. Rombouts set this religious scene in an inn, and gave Peter such realistic, indeed crude, features that he is indistinguishable as a saint from the common folk around him. This genrelike treatment sets Peter on a par with the congregation, a subtle device that calls upon the faithful to follow Christ. Rombouts� picture captures the moment when Peter first betrays Christ after he has been taken prisoner (Gospel according to Luke 22:54 ff). Peter had followed Jesus from some distance behind, mingling with the crowds and awaiting the events that were to unfold in the High Priest�s courtyard. When a maid recognized him as one of Jesus� disciples, Peter vehemently denied it. The motif reflects the Baroque�s fondness for representations of moments of insight that also contain an element of surprise. Rombouts� composition and figures are based on a version of this theme by Caravaggio, which the Dutch artist would have been able to see in the church of San Luigi dei Francesi in Rome. In it, too, recent arrivals interrupt a group in conversation. The significance of the scene is accentuated by dramatic lighting that impressively illuminates the moment of sudden insight. — Allegory of the Five Senses (207x288cm; 870x1199pix, 168kb) _ detail: Hearing (1121x820pix, 119kb) _ Art-lovers in the 16th and 17th centuries were very fond of emblematic paintings, although the content of a work of art often served merely as a pretext for a display of painterly ingenuity. This painting fits this pattern perfectly. From left to right, sight, hearing, touch, taste and smell are represented by figures and attributes set in a lively and colorful composition. The painting was commissioned by Bishop Anton Triest, a well-known patron of the arts in Ghent. 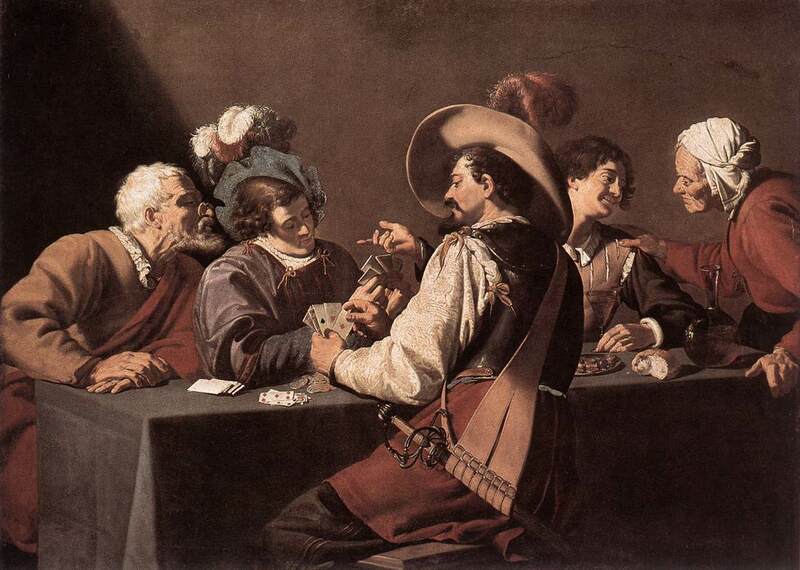 — Two Card Players and Three Bystanders (152x206cm; 800x1123pix, 136kb) _ As far as the subject matter is concerned, this is a genre painting, depicting as it does a jolly scene from everyday life probably with a moralizing undertone. The painting is large in format, realistic in conception and traditional in style, and its subject is portrayed in sober and monumental fashion. — Two Card Players (850x997pix, 102kb) _ The influence of Rubens, the best painter in all genres in the 17th-century Flanders, overlaid that of Caravaggio which had swept over north European painting since before 1600. Rombouts hesitated between Caravaggio and Rubens as can be detected in this picture. 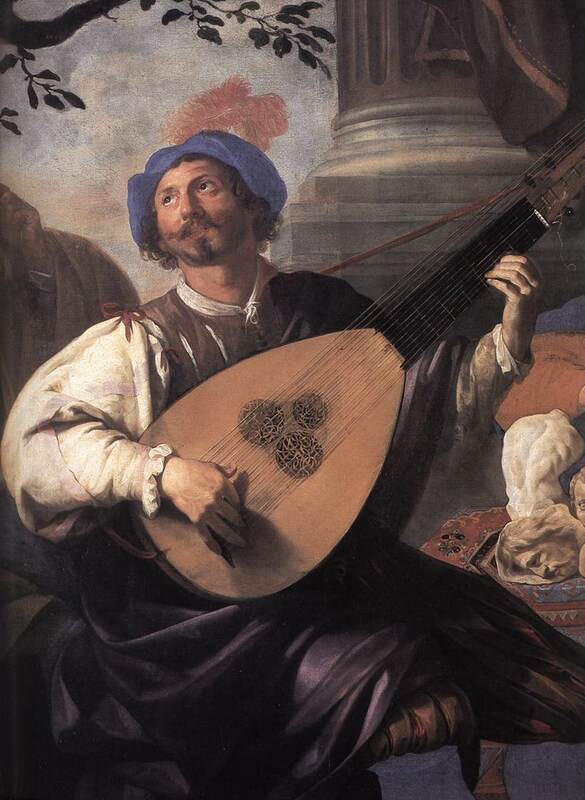 — Man Tuning Up his Lute (70x79cm) almost exact copy of the 1620 painting by Rombouts. The musical theme is complemented by other pleasures, represented by the pipe and the beer mug. — Prometheus _ Ce Titan est le fils de Japet et de Thémis, ou de Clyméné, fille d'Océan. Prométhée (le prévoyant), escroc intelligent qui parviendra à duper Zeus à l'origine, deviendra le personnage central de nombreuses tragédies qui bâtiront sa légende. Hésiode, dans la "Théogonie", et Eschyle, dans "Prométhée enchaîné", en feront le sauveur de l'humanité. Zeus, principal personnage des deux autres tragédies de la trilogie d'Eschyle, sera représenté sous les traits d'un tyran. Prométhée, qui avait anticipé les événements, conseillera aux Titans d'utiliser la ruse pour vaincre les dieux. Il ne sera pas suivi et rejoindra le camp de leurs ennemis. Prométhée entrera en conflit avec Zeus au sujet des hommes, après la victoire des dieux et la séquestration des Titans dans le Tartare. Hésiode rapporte que Prométhée créera la race humaine à partir d'une motte d'argile provenant de Panopée, en Béotie. Il façonnera les figurines auxquelles Athèna insufflera la vie avant de les soumettre à l'approbation de Zeus. La déesse oubliera cette formalité pour un adolescent particulièrement beau, nommé Phaenon (éclatant). Zeus enlèvera le garçon et en fera la planète de Jupiter. Zeus voudra supprimer la race humaine pour la punir de sa méchanceté et créer une race nouvelle et meilleure. Il privera les hommes de feu et tentera de les faire mourir de faim en demandant le sacrifice du meilleur dans la nourriture humaine. Prométhée, qui voulait sauver les hommes, organisera avec les dieux une réunion à Mécôné (Sicyon) afin de déterminer quelles parties de la viande devaient leur être réservées. Prométhée, choisi comme arbitre, divisera un boeuf en deux parts. La première contenait les entrailles qu'il entourera de graisse. L'autre, recouverte du ventre de l'animal, était la meilleure. Zeus supposera un piège et choisira le premier quartier qui sera, depuis cette date, réservé aux sacrifices. Zeus se rendra compte de son erreur et décidera de priver les mortels du feu. Prométhée dérobera le feu, dans une tige de fenouil, sur l'Olympe ou dans la forge d'Héphaïstos. Il enseignera aux hommes plusieurs techniques, dont la métallurgie. Il leur retirera la connaissance de l'avenir, qu'ils possédaient, pour ne pas les tourmenter. Zeus demandera à ses serviteurs, Cratos et Bia, ainsi qu'Héphaïstos, d'arrêter Prométhée et de l'enchaîner sur une montagne, aux confins de l'Océan. Il enverra quotidiennement son aigle lui ronger le foie qui renaissait pendant la nuit. Prométhée, qui était de la race des Titans, était immortel selon les uns ou avait reçu ce don de Chiron qui souhaitait mourir. Eschyle rapporte que Zeus, ne pouvant connaître le secret de l'immortalité de sa victime, frappera le rocher sur lequel le prisonnier était enchaîné de sa foudre et le précipitera dans le Tartare. Zeus délivrera Prométhée beaucoup plus tard, pour savoir si le fils né de Thétis (que Zeus et Poséidon courtisaient depuis longtemps) serait plus puissant que son père. Héraclès, le fils de Zeus, tuera l'aigle et délivrera le prisonnier. Prométhée indiquera alors au héros le moyen de se procurer les Pommes d'or des Hespérides, 'les filles du couchant" au nombre de quatre ou de sept selon les auteurs. Elles seraient nées d'Atlas et de Pléioné. Les mythographes ne sont pas unanimes. Certains prétendent que les Hespérides seraient les filles d'Atlas et d'Hespéris, d'autres, les enfants de Nyx et de l'Erèbe. Elles porteront le nom de Aeglé, Erythie, Aréthuse, Hestia, Hespéra, Hespérousa et Hespéraea. Atlas vivait non loin de leur jardin, portant la voûte céleste sur le dos. Ces pommes, offertes en présent de noces par Gaia à Héra, étaient gardées dans un jardin situé aux confins du monde par ces Hespérides et le dragon Ladon qui possédait cent têtes. Héraclès consultera les Nymphes du fleuve Eridan (Pô) qui lui conseilleront d'obliger Nérée à lui dire où se trouvait le jardin. Le héros flattera la divinité marine qui prenait les formes les plus fantastiques, lorsque l'on essayait de l'attraper pour apprendre que le jardin se situait dans l'extrême Occident. Le voyage sera émaillé d'aventures. Il mettra à mort Busiris, le roi d'Egypte, qui voulait le sacrifier à Zeus, luttera en Libye contre le puissant Antée, fils de Gaia et le tuera en le soulevant au-dessus du sol. Il sortira vainqueur d'une lutte à mort avec Lycaon, un fils d'Arès qui l'avait défié, volera un boeuf à Rhodes, le sacrifiera puis le mangera sous les injures de son propriétaire. Les sacrifices offerts à Rhodes à Héraclès seront, dès lors, toujours accompagnés de malédictions. Héraclès, suivant les conseils de Prométhée, persuadera le Titan Atlas d'aller les cueillir pendant que lui-même, aidé d'Athéna, soutiendrait le ciel. Le Titan refusera de reprendre son fardeau et décidera de remettre lui-même les pommes à Eurysthée. Héraclès fera semblant d'accepter et demandera à Atlas de le soulager le temps de mettre un coussin sur sa nuque. Il repartira avec les pommes sans demander son reste. Dans une tradition connue d'Euripide, Héraclès tuera Ladon et cueillera les fruits sur l'arbre. Ayant soif, il fera jaillir une source en frappant le sol. Cette source devait, plus tard, sauver les Argonautes. Une autre version rapporte qu'Emathion, fils d'Eos et de Tithonos, tentera d'empêcher Héraclès de s'emparer des pommes et sera tué. Héra placera Ladon dans le firmament où il deviendra la Constellation du Serpent. Cette version prend en compte le mythe selon lequel Atlas avait été transformé en une chaîne de montagnes. Le Titan aurait affronté le regard de la Gorgone en regardant la tête du monstre tenue à bout de bras par Persée. Eurysthée rendra les pommes héros car il ne pouvait garder des objets aussi sacrés. Athéna les rapportera dans leur jardin. Zeus n'épousera pas Thétis après les révélations de Prométhée. Zeus concevra une première femme pour punir les hommes ainsi que Prométhée. Héphaïstos façonnera Pandore (tous les dons) à partir de l'argile, Athéna lui donnera la vie et l'habillera, Aphrodite lui donnera la beauté pour attirer les hommes et Hermès lui apprendra le mensonge. Zeus offrira la main de cette créature à Epiméthée (celui qui réfléchit après coup), le frère déraisonnable de Prométhée. Il lui remettra une jarre, ou une boite scellée, contenant les maux qui affligeront l'humanité ainsi que l'Espérance, placée au fond. Epiméthée passera outre le conseil de Prométhée de ne pas accepter un présent venant de Zeus. Pandore ne pourra résister à la curiosité d'ouvrir le récipient et libérera ainsi les fléaux, les maladies, les vices et tous les malheurs qui frapperont les êtres humains. Pandore refermera le couvercle trop tardivement. L'Espérance restera enfermée dans la cassette. Elle se fera entendre pour être à son tour libérée, afin d'alléger les peines. Les hommes devront, dès lors, s'épuiser à la tâche afin d'assurer leur existence. Certaines traditions rapportent que la cassette, qui appartenait à Prométhée, contenait tous les biens destinés l'humanité. Pandore trouvera l'objet et laissera s'échapper pour toujours ces bienfaits. L'Espérance, plus lente à réagir, restera emprisonnée. Pandore accouchera d'une fille, Pyrrha, qui épousera Deucalion. Elle survivra ainsi au déluge que Zeus enverra pour anéantir tous les hommes. Prométhée conseillera à Deucalion et Pyrrha de jeter les os de leur mère par-dessus leur épaule afin de faire renaître la race humaine. Certains attribuent cette suggestion à Thémis, la mère de Prométhée, qui lui aurait transmis sa sagesse. Prométhée sera honoré, comme dieu des artisans, en Attique. Les traditions diffèrent sur le nom de sa femme. — Cavalier and a Market Girl (360x465pix, 28kb) _ The still-life painter Adriaen van Utrecht [1599-1652] painted the vegetables in the foreground. _ This is a fragment of one of several versions of a market scene, one of which, Game and Vegetable Vendors, still exists whole and shows an elaborate arrangement of vegetables on a long table manned by two vendors. Rombouts was esteemed as a painter of history and genre scenes with allegorical content. But Rombouts also hired himself out as a figure painter and collaborated numerous times with other artists. Both Van Utrecht and Rombouts went to and worked in Italy, where they became familiar with the work of Caravaggio [1571-1610], whose dramatic use of chiaroscuro inspired many artists. Rombouts, who lived in Italy from 1616 to 1625, became the foremost Flemish painter to imitate Caravaggio. The painting fragment is a genre scene, with a moralizing theme that refers to inappropriate behavior. A disheveled young man accosts a modestly dressed young woman. The man wears a metal neckpiece that suggests he is a soldier. His tousled hair, leering expression, and untidy clothing seem to indicate that he is inebriated. The complete painting shows that the woman is behind the table and not standing in front as a customer would be: she is the wife or employee of the vendor to whom she is appealing for help, as her turned head and her gesture suggest. Also, she is wearing a formless yellow smock to protect her clothing. The artichokes directly beneath the woman�s elbow may have symbolic meaning: just as prickly artichokes are unpleasant to the touch, so the soldier�s offensive conduct will prompt an unpleasant response. In the complete painting, the male vendor�s facial expression as he is speaking to the soldier, his exposed beefy forearm, and his gesture at a pheasant on the table are an unmistakable warning that the soldier may end up like a �dead bird� if he continues his unwanted advances. 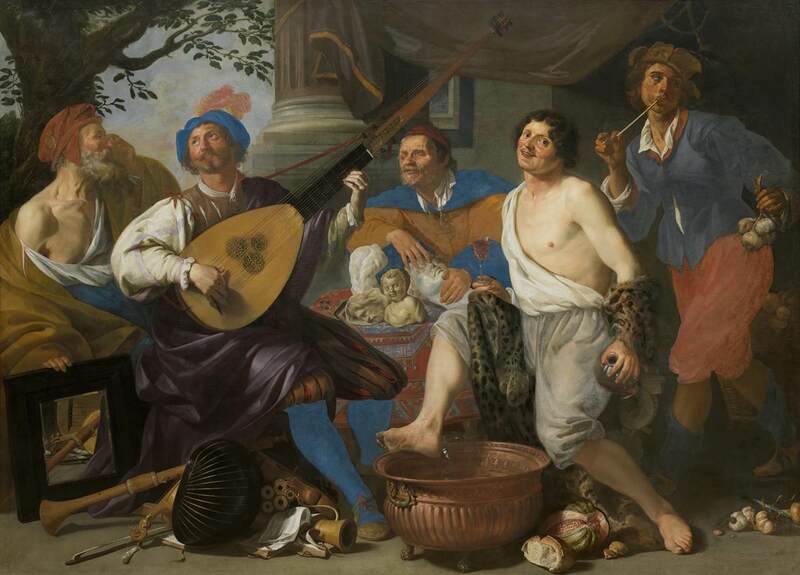 � Three Musicians Playing in a Tavern (391x630pix, kb) _ Almost identical to The Concert (420x533pix, kb) and Concert in an Interior (320x630pix, kb) by Rombouts, and to Three Men Making Music Around a Table (420x575, 16kb) by Bartolomeo Manfredi [1582-1622]. Sitting at a table, a theorbist and a recorder player accompany a singer who stands between them. A serving man brings them wine. On the table are open music books, a lute, a cittern and an unusual flute which appears to be made of ivory with a wooden insert in the head joint. The recorder is a near-cylindrical tenor with a one-keyed foot-joint and fontanelle. –- The Continence of Scipio (117x147cm; 627x800pix, 117kb) there is a slightly different version. _ The Roman general Scipio is releasing the young woman, which he was holding as a prisoner of war, when he hears that she was going to marry. Scipio's magnanimity provided seventeenth-century leaders with an example. Caravaggio's influence can be seen in the way in which Rombouts focuses on the main characters through the use of light. In this painting the light falls mainly on the girl being released. The background has been kept extremely dark and Rombouts has used relatively little contrast in the color. _ Further comments and links toThe Continence of Scipio by other painters. ^ Born on 14 September 1867: Charles Dana Gibson, US Golden Age illustrator, who drew "Gibson Girl" (and many other subjects). He died on 23 December 1944. — She was tall and graceful as a gazelle, with a long neck balanced on broad shoulders and a mass of upswept wavy hair. She played tennis and golf, rode horses and bikes, and looked as coolly elegant in her shirtwaists as she did in evening dress. She was the US 's ideal, the wholly imaginary but throughly convincing Gibson Girl. When the first of his "girls" appeared in one of Charles Dana Gibson's illustrations in the early 1890's, the US was still something of a social backwater. The country's newly rich were prone to proving their worth by marrying their daughters off to titled Europeans, no matter how fusty or gout ridden. Gibson disapproved. And in his lampoons of such behavior, he created an image of US womanhood where none had existed before. In her sweeping skirts and towering pompadour, the Gibson Girl, who appeared week after week in the humor magazine Life, among other publications, was an enticingly noble creature. Slightly aloof, she was a goddess forever being wooed by unworthy suitors. Not even the squarejawed, clean-shaven Gibson Man quite measured up. But while she was definitely upper crust, she was not a snob. In short, she was a paragon. Men idolized her and women looked to her to learn how to dress, walk, sit, and dine. "You can always tell when a girl is taking the Gibson Cure," wrote on observer, "by the way she fixes her hair." In fact, the whole country seemed to be taking the Gibson Cure. People filled their parlors and bedrooms with franchised likenesses of the girl, framed as lithographs, engraved on wood, printed on chinaware, embossed on spoons, and repeated on wallpaper. So great was her popularity between the 1890's and World War I that Gibson earned as much as $65'000 a year (close to one million dollars of 2003), and women on two continents claimed to have been his original model. During those prewar decades the Gibson Girl made a lot of people feel pride in being of the US, for hers was a style that few could resist. "Parents in the United States are no better than eleswhere," wrote one European visitor, "but their daughters! Divinely tall, brows like Juno, throats that Aphrodite might envy. ^ >1893 Pieter Gerardus Vertin [21 Mar 1819–], Dutch painter (aka Petrus Gerardus Vertin, Pieter Gerard Vertin). Born at The Hague, he studied art at The Hague Academy under the noted artist Bartolemus van Hove. Vertin specialized in landscape and townscape painting. He died in Amsterdam. –- View of Delft (36x28cm; 1012x744pix, 82kb _ ZOOM to 2607x1916pix, 376kb) _ The two main buildings and three of the women before them are almost identical in these two last pictures. See them side by side in a 1012x1591pix, 271kb picture which, once loaded, will shrink to fit you browser window if it is smaller. 1907 Walter Kurt Wiemken, Swiss artist who died (main coverage) on 30 December 1940. ^ 1853 Axel Hjalmar Ender, Norwegian painter who died in 1920. — Relative? of Edouard Ender [1822-1883]? ^ 1734 Jean Henry d'Arles, French landscape painter who died in 1784. Henry (or Henri) d'Arles studied first with a minor Marseilles painter of flowers and landscapes, Kapeller, of whom little is known. With the foundation of the Royal Academy of Painting and Sculpture of Marseilles in 1753, Henry d'Arles entered the studio of Claude-Joseph Vernet [1714 - 1789] and quickly adopted his teacher's style and subject matter. Later in his career Henry d'Arles was to be known by some as 'Vernet's monkey' and although he can be criticized for lack of originality, he was justly proud of how closely his technique and style came to that of his teacher'. In 1776 Henry d'Arles was appointed a Professor at the Academy of Toulouse. — Paysage de rivi�re anim� par temps calme (47x63cm; 450x600pix, 46kb) ... mais un orage menace. 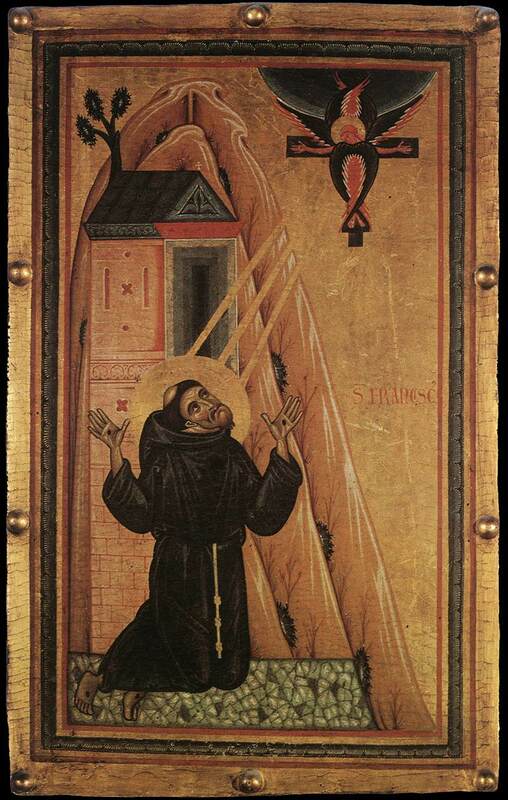 ^ 1224 Saint Francis of Assissi receives the stigmata (on 16 Sep 1224 according to some sources). 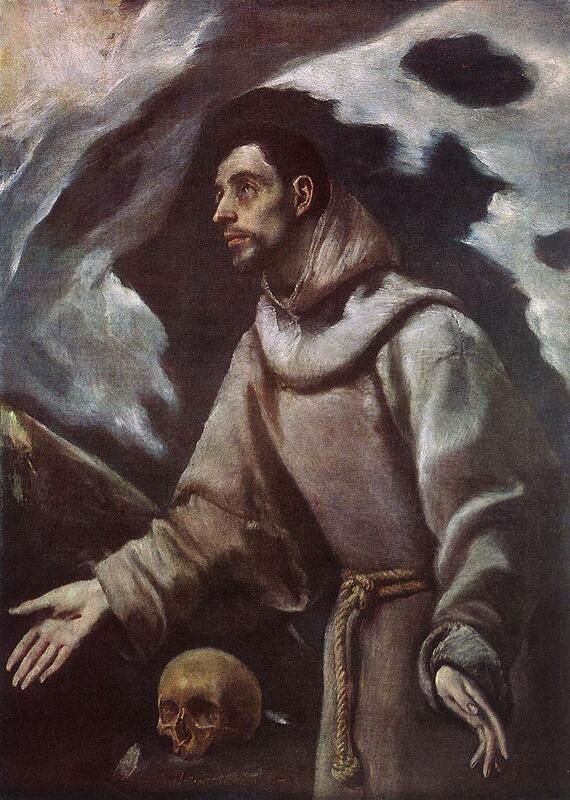 When Francis of Assisi [1182 – 03 Oct 1226] was in his early forties, he gave up leadership of the Franciscans, the great order he had founded. This was not done in pique or bitterness but with a quiet acceptance that events had moved beyond him. His simple and stringent rule was too difficult for the many who had swarmed into the order because of his fame and the powerful preaching of his followers. They wanted the rule relaxed, and relaxed it would be. If Francis thought he could now be just one of the brothers, he was mistaken. None had such zeal as he. Of none would such legends be told. To none other would such visions come. He decided to spend some days before the Feast of the Assumption at Mt. Alvernia. In that wilderness a flock of birds settled around and upon him to the astonishment of his few companions and succeeding generations. At Mt. Alvernia, Francis decided he needed more solitude. The sense of his own sin was heavy upon him, and he longed for a taste of heaven in order to bear the pain of his past wrongdoing. He found a lonely spot in the forest across a chasm. Only one man was allowed to approach him in his solitude his spiritual son Leo; and even Leo must call out and receive permission before crossing the limb which served as a bridge to Francis' isolation. The brothers feared for Francis. He was gravely ill. One night Leo approached the chasm and called out. Francis did not answer. Leo called again. Perhaps the master had taken ill. Fearful of disobedience and yet even more fearful that the holy leader might be dying unattended, Leo crossed the limb. Francis' cell was empty. Yet the moon was bright. Leo went some way and heard a voice. It was Francis, praying, "Who are you, my dearest Lord? And who am I, a most vile worm and your most unprofitable servant?" 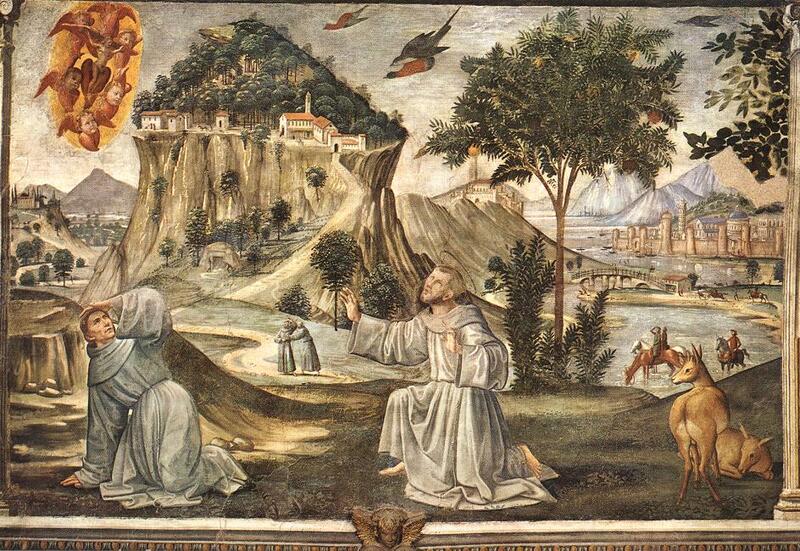 Leo saw a light shine down upon Francis and knew that words were spoken to him, although he could not hear them. Francis raised his hands into the light. The light disappeared. Leo turned to creep away, but Francis heard. He challenged him, for he was almost blind. Leo confessed he had broken the command. Francis was gentle. The transgression was from love. Francis told Leo that he had been commanded to give three gifts, and these three gifts were as golden balls in his bosom: poverty, chastity, and obedience. He had held them up to the Lord. The two men then read and prayed together. Then on the morning of this date, 14 September 1224, the day of the Feast of the Holy Cross, as Francis is communing with the Lord, a Seraph appears to him. The figure of Christ crucified appears between his wings. Joy and agony suffuse Francis. His prayers for forgiveness, to share Christ's sufferings, to be purified, are heard. When the angel leaves, in what is regarded as one of the classic experiences of all Christian history, Francis' hands feet and sides bear five wounds, the marks of the stigmata. Two years later the saint would have gone to Heaven. 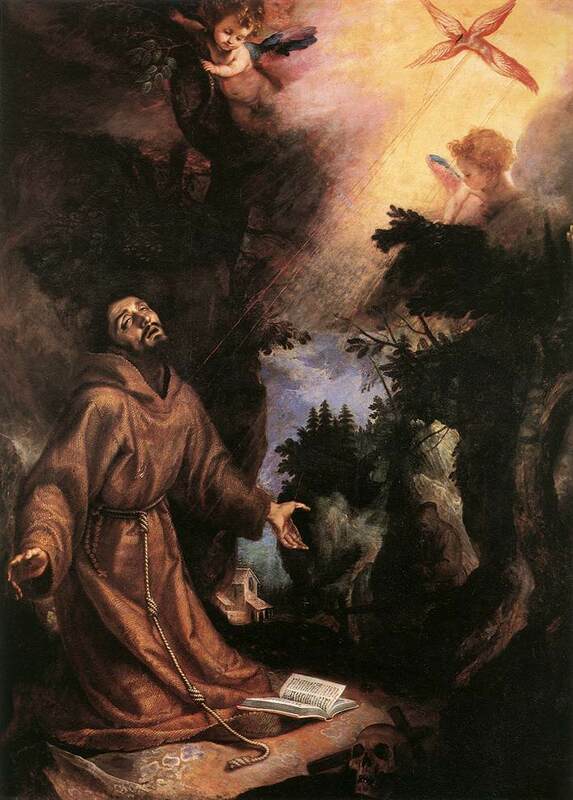 _ by Cigoli: St Francis Receives the Stigmata (1596; 989x708pix, 105kb) _ This is a work with high pietistic content, which interprets fully a sort of anti-Mannerist reaction of a religious-moralistic nature. Leaving aside the facile emotivity generated by the emphatic pose of the kneeling saint and the mystical, theatrical smoke which heralds the divine event, the painting is a work of extreme austerity, and avowedly prosaic even from a technical point of view, considering that the artist, breaking with the Tuscan design tradition, executed it in the Venetian style, almost entirely with color. _ by El Greco: Saint Francis Receiving the Stigmata (1595; 581x541pix, 18kb), Saint Francis Receiving the Stigmata (1590, 105x80cm; 1364x1030pix, 107kb) and St. Francis Receiving the Stigmata (1580, 102x75cm; 950x677pix, 154kb) _ There are more than a hundred paintings of St Francis from the workshop of El Greco, mainly for the three Franciscan monasteries and seven cloisters in Toledo. This one, listed here last, a formerly unknown signed painting, was discovered in 1966. _ by Rubens: St Francis of Assisi Receiving the Stigmata (1635, 264x192cm, 1098x817pix, 150kb) _ This altarpiece decorated a sidealtar in the former church of the Franciscan Recollects. 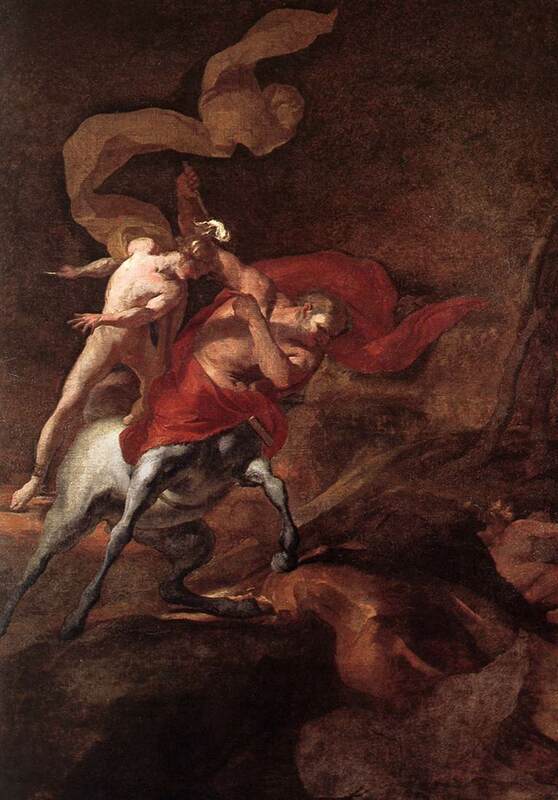 With its soft, grey tonality, it is an example of Rubens' late style.